It seems that the novated car leasing industry, as well as the broader salary sacrificing tax minimising services sector, will be unaffected by the upcoming election. The Labor Party learnt its lesson in 2013 when it said that it would save $1.8 billion by removing employees’ ability to deduct personal use of leased cars from fringe benefits taxes. That statement resulted in shares in salary sacrificing group, Macmillan Shakespeare (ASX:MMS), plummeting from about $18.00 to $8.00. At that stage, Macmillan was the only specialised salary packaging/car leasing business listed on the ASX, and it was a company that had performed extremely well over many years. The company’s dominant market position, combined with earnings predictability, made it a favourite for safe haven investors, enhanced further by its ability to pay strong dividends. 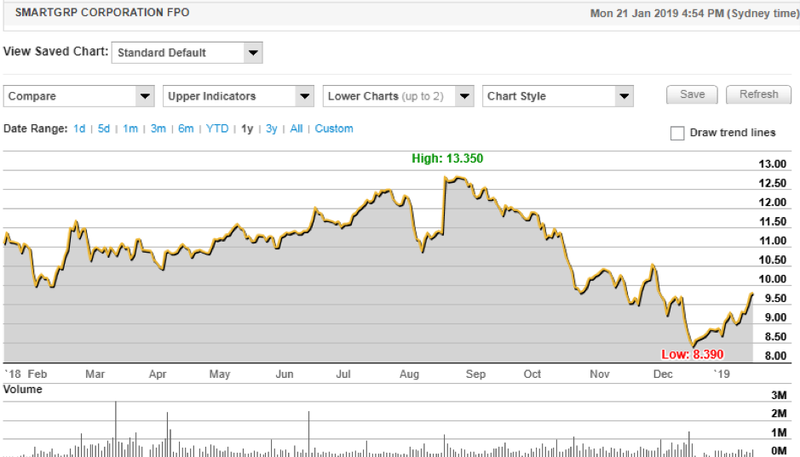 Macmillan’s performance is reflected in the following share price chart, which spans nearly 14 years. 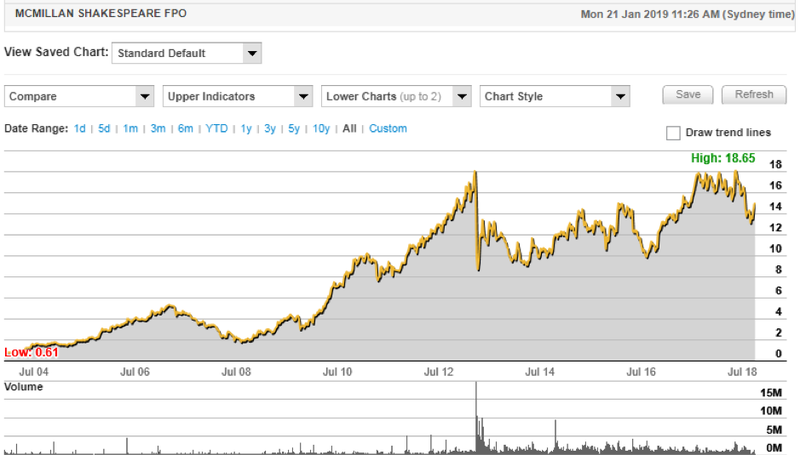 As you can see, the company has rarely taken a breather as its share price increased 30-fold from 61 cents when it listed on the ASX in 2004, to hit a recent high of $18.65 in September last year. The only major correction was in 2013, but it has taken some time to claw back the ground lost on that occasion. In fact, it was November 2017 before the company once again broke above the $18.00 mark, and that continues to be a resistance point. There are a few reasons why the company didn’t recapture that ground earlier and continue its previous strong share growth trajectory. Most importantly, though, the market wasn’t convinced that either political party would backflip once again in terms of making legislative changes that would undermine the tax benefits of salary sacrificing. However, a down and out coalition government is unlikely to be introducing negative taxation legislation so close to an election, and in any case, judging by the polls, they are not going to be there to execute any taxation reforms. From Labor’s perspective, in unequivocable terms, it advised The National Automotive Leasing and Salary Packaging Association that a Shorten Labor government would not implement any changes to the Statutory Formula Method relating to employer-provided motor vehicles. Further, it said it would retain the current arrangements in relation to all measures regarding salary packages and related fringe benefit tax measures. Citi has set its target price for the combined entity at $17.45, but this factors in a discount for some of the risks that could be encountered from the acquisition of Eclpix. 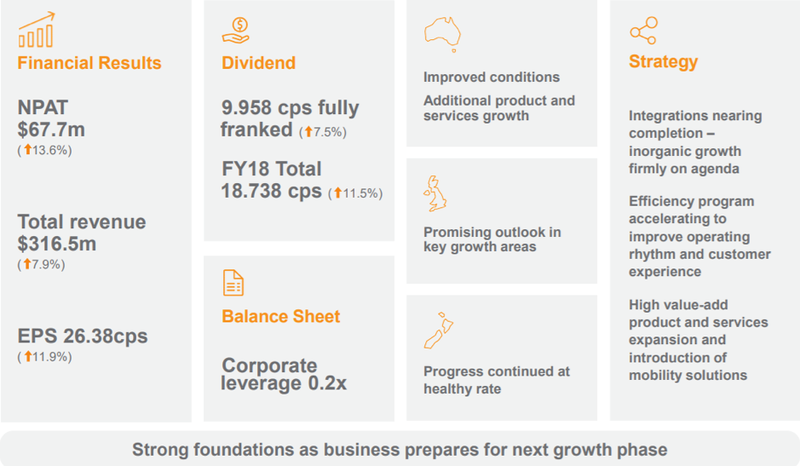 Should the acquisition realise full synergies without any earnings erosion from the transaction, this would see the group trading on a forward PE multiple of 11.4 — fairly conservative given its growth profile and market-leading position. There is also scope for further consolidation in the sector, with two other key players likely to be on Macmillan’s radar. 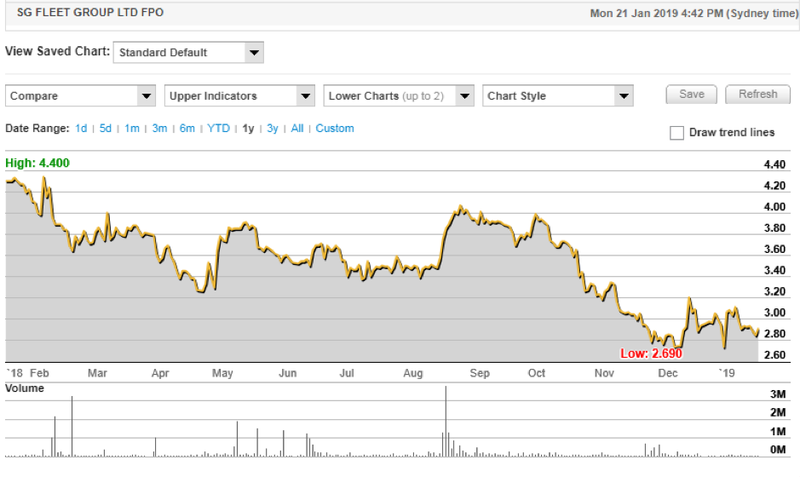 The above chart shows the impact of this news as Macmillan’s shares increased from about $12.00 to $15.00 in May 2016. With the company delivering strong revenue and profit growth over the last five years, there was no other way than up for its share price, and over the last 12 months, it has mainly traded in a tight range between $16.00 and $18.00. The highly likely (but yet to be ratified) acquisition of Eclipx Group (ASX:ECX) will provide extra earnings momentum in coming years. Citi analyst, Ross Barrows, is forecasting that a full year contribution from Eclipx in fiscal 2020 will add $143.1 million in EBITDA plus $35 million in synergies. Based on these numbers, the combined entity should generate a fiscal 2020 profit of $198 million, representing earnings per share of $1.53. One of those players, SG Fleet Group (ASX:SGF), had a tilt at Eclipx in 2018, but management rejected the proposal in favour of Macmillan’s offer, which has been unanimously accepted by the board. Still, that doesn’t mean SG Fleet doesn’t have its merits on a standalone basis, and with the group trading close to its 12 month low and well short of consensus price targets, now may be the time to pounce. It also needs to be noted that the other key player — the $1.2 billion Smartgroup Corporation (ASX:SIQ) — has been fairly active on the acquisition front over last two years, and it could see some benefits in acquiring the $750 million SG Fleet. This could create a duopoly of sorts with both groups having sizeable market shares and capped around the $2 billion mark. However, one factor standing in the way of a SIQ/SFG merger/acquisition could be the ownership structure of the latter, as any transaction must not dilute the ownership of controlling shareholder, South African conglomerate Super Group below 50.1% of SGF’s issued capital. This was a hurdle in SG Fleet’s proposed acquisition of Eclipx, wherein the group was limited as to the capital component of the offer, pressuring it to pay cash/increase debt to make the acquisition. Consequently, investors who like the SG Fleet business would be best to consider it a standalone business with the potential ability to make smaller bolt-on acquisitions. The company has certainly demonstrated its ability to deliver growth from its established businesses, while cherry-picking smaller acquisitions that have provided it with strategic benefits in terms of geographic positioning and industry market share. Stepping back a bit, SG Fleet also pulled off a sizeable acquisition of an unlisted group, nlc. The $200 million acquisition, which included the vendor’s $46 million in net cash, complemented the group’s novated business model and provided an established client base, while also opening up consumer-style options and cross-selling opportunities. Other acquisitions have been instrumental in providing SG Fleet with a position in the UK. Here, there is substantial growth for salary sacrificing businesses as the region has not been as active in areas such as novated leasing. 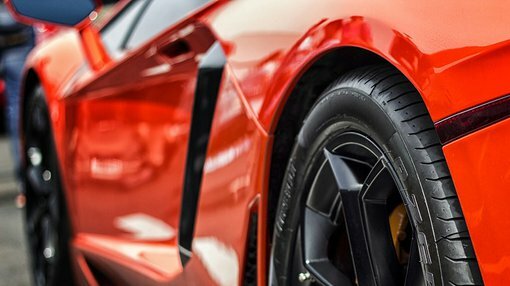 Another UK acquisition was that of Fleet Hire, a provider of contract hire, salary sacrifice, short-term rental and fleet management services. The £25.7 million acquisition provided important scale in the attractive UK market and, in combination with its existing local business, created a profitable platform for continued growth. A number of other UK acquisitions were made around that period and, since then, the company has delivered strong profit growth. Between fiscal years 2016 and 2018 inclusive, year-on-year underlying profit growth has been 26.8%, 27.2% and 13.6% respectively, equating to three-year compound annual earnings per share growth of more than 20%. Without the benefit of acquisitions in the last 12 to 18 months, analysts are forecasting earnings per share growth over the next two years to be approximately 10% per annum — still a reasonable clip, particularly for a company trading on a forward PE multiple of 9.8. The company is also well-positioned to pay strong dividends over the next two years with analysts forecasting 19 cents per share and 21 cents per share in 2019 and 2020 respectively. SG Fleet’s dividends are 100% franked, which on a grossed up basis translates into a fiscal 2019 dividend in the order of 27 cents per share, implying a yield of nearly 10% relative to the group’s recent trading range. Smartgroup Corporation’s fundamentals also look attractive, particularly after a recent share price retracement which has seen it pull back from an all-time high of $13.35 after it spiked on the back of the quality half year result in August. Stocks with this background are often ones to target when there is a broader market sell-off, as a positive reaction to recent developments within the company is an endorsement in its own right, and it is obvious that share price weakness is not related to the underlying business. 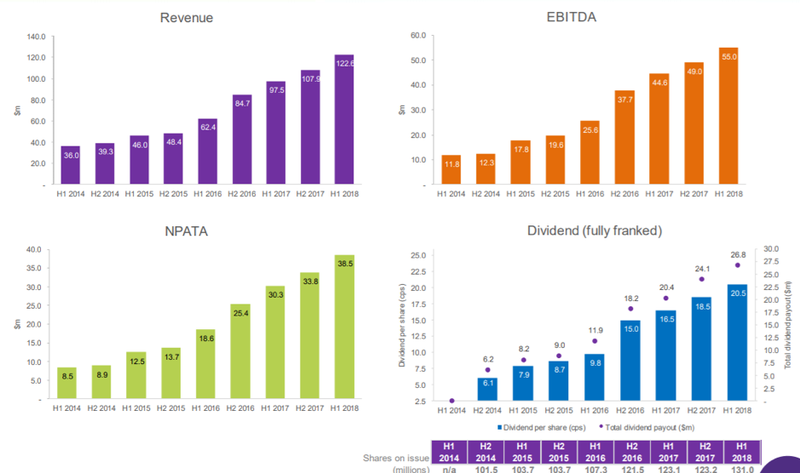 This is especially the case with Smartgroup, which has an impeccable record of consistently delivering strong growth in revenues, profits and dividends, as indicated below. The robust nature of the business was demonstrated in August, with Smartgroup’s delivery of its interim result for the six months to June 30, 2018 — profit was up 27% and management provided a positive outlook statement for the remainder of the fiscal period. It has only been global volatility that has weighed on the company’s share price as it struck a low of $8.39 towards the end of December. While it has recovered some of that ground, now trading in the vicinity of $10.00, the consensus 12 month price target of $12.90 implies upside of approximately 30%. The foundation for a strong result for the 12 months to December 31, 2018, was laid in 2017 as the group successfully integrated the acquisitions of AccessPay, Aspire and RACV Salary Solutions. These will continue to have an impact on the group’s 2018 result, with the company already delivering year-on-year net profit growth of 27% for the six months to June 30, 2018. Smartgroup’s balance sheet is also looking in good shape, with net debt having reduced from $111 million as at December 31, 2017, to $27.9 million as at June 30, 2018. The company’s impressive net cash from operating activities of $37.6 million has provided the capacity to strengthen its balance sheet, positioning the group to make further acquisitions or grow organically off what is already a robust diversified business, with activities spanning salary packaging and fleet management, as well as workforce and payroll services. 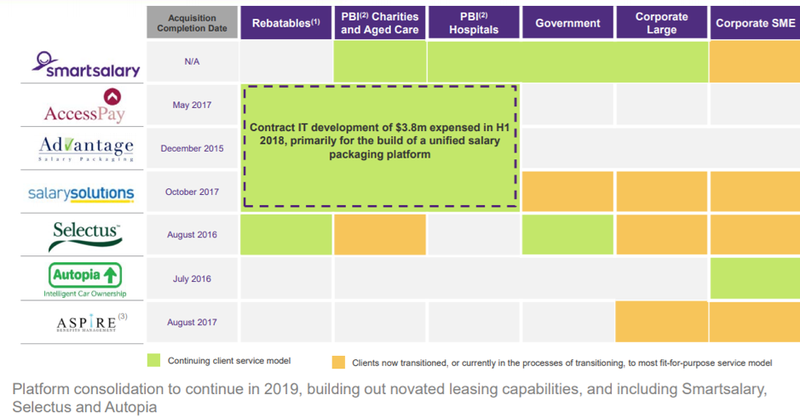 The graphic below demonstrates the broad based nature of the company’s service offering, while also indicating areas where organic growth can be achieved in fiscal 2019.